Thank you for your interest in working for Multitech Site Services. 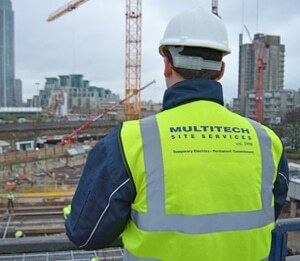 Multitech provides temporary site services, primarily temporary electrics, to leading UK construction and development companies. We have office based support staff in Great Dunmow and Wellingborough with regional teams of electricians and plumbers throughout London and the Home Counties, the South East and Midlands. 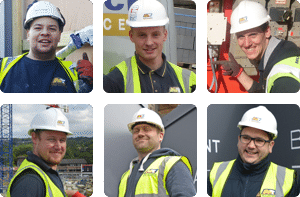 Our staff enjoy long-term careers at Multitech Site Services. The Multitech teams are dedicated, skilled and focused on driving our embedded safety and service culture. This is a direct result of having an unwavering policy of direct employment with staff enjoying PAYE, full-time salaried positions. We are committed to the training, nurturing and support of personnel and the facilitation of long-term career prospects. As a leader in our industry the Multitech ethos is to create a workplace environment in which our people have opportunities and can thrive; work for us and enjoy your career. The family feel to it – it’s very welcoming! We like the fresh fruit on Mondays and doughnuts on Fridays! Our embedded safety culture ensures not only that client safety expectations are exceeded, but also that our people are kept safe and keep those around them safe as well. Each year Multitech holds a Safety Conference which sets the precedent for the coming months. In addition, each month our Managing Director makes multiple site visits with our safety officer to ensure safe working conditions are being maintained and that installations are being carried out to the highest standards. We carry out regular staff development reviews which identify training and development opportunities. Commitment and dedication does not go unnoticed and is rewarded with encouragement, support, ongoing professional qualifications and skills improvement. Dental and medical insurance and a childcare voucher scheme is available to all staff. The Multitech Head Office is based in Great Dunmow and our Midlands Office is in Wellingborough. Site staff are based regionally throughout London and the Home Counties, the South East and Midlands with support staff based at one of our offices as indicated with the respective vacancy. Multitech Site Services Ltd actively promotes available jobs online and through preferred, approved, appointed recruitment agencies. Multitech will not accept unsolicited candidate details from any non-appointed supplier but reserve the right to keep unsolicited candidate details on our own database without any obligation to the agency concerned. Multitech is in no way obligated to accept or acknowledge CV’s sent by non-appointed recruitment agencies. Non-appointed recruitment agencies will in no way be entitled to claim any type of fee should a candidate be employed that has also by coincidence had their CV sent by an appointed recruitment agency. Unsolicited approaches by any means may adversely affect the opportunity of working with Multitech in the future. Multitech have recently reviewed appointed recruitment suppliers are are currently not looking for new recruitment agencies.